Home › Ipplepen businesses › August News! Between my writing this and you reading it our AGM and the Village Show will have come and gone and we will be heading full tilt to the Carnival Week starting on August 5th. Later this month the Ipplepen Archaeology Project starts again and the Information Centre at the Hub will be open weekdays between Tuesday 21stAugust and Friday 14thSeptember, 10am – 4pm.This year’s PUBLIC OPEN DAYfor the dig will take place on Saturday 8thSeptemberbetween 10.30am and 3.30pm.Also on Saturday August 18tha small group of our members will be visiting the Italian Gardens at Ambrook. Most of the summer carnivals in South Devon can trace their origin back a hundred years or so but looking back at our records in Ipplepen the current format came into its own in the period after World War Two with the emphasis then being on the procession itself rather than a whole week of events. If anyone knows more about the origins of carnival in Ipplepen I will be grateful to hear from you. Following on from last month here’s another extract from Reg Honeywill’s feature ‘Looking at our Village’ which first appeared in the Ipplepen and Torbryan Parish News, August 1973. ‘At the foot of North Street there was once a Village Duck Pond, near Priory Lodge. On the other side of the street, behind a short length of ornamental iron railing, there is on the lawn of an old house, an ‘Upping Stock’ or mounting block by which ladies were able to mount horse-back. They rode ‘side-saddle’ in those days of ankle-length skirts, and both stirrups hung on one of the horse’s flanks. There are many of these blocks in the neighbourhood, and usually consist of three stone steps leading to a small square platform’. 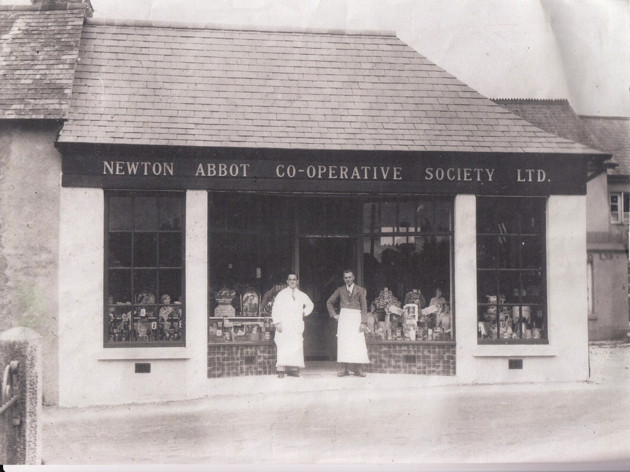 In the light of our Coop’s recent refurbishment I couldn’t resist a look at Ipplepen’s first Coop in 1930. I suspect that parking problems were not an issue back then.